Today's digitally equipped world has a major part of work in the Information Technology arena, offering more scope for innovative research that best influences the human existence for good. 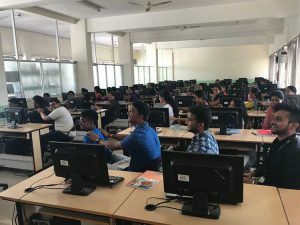 Vemana Institute of Technology (Vemana IT) introduced the Information Science & Engineering (ISE) Department in its bandwagon of education more than a decade ago. The department was started with an initial intake of 60 and the current intake is 120. Vemana IT’s vision is to nourish the true spirit and wisdom of Information Technology in the minds of young aspirants. To achieve this goal, the department has 18 enthusiastic, young, diligent, and dedicated team of faculties. Our faculties have published more than 100 technical and research papers in the relevant fields of Information Technology. The department has proved itself to be consistent by achieving high percentage of results from the beginning. 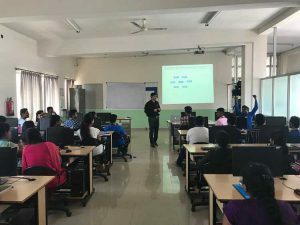 With exceptionally qualified professors with rich teaching experience make Vemana Institute as one of the top engineering colleges and best ranked in Information Technology in Bangalore, Karnataka, India. To transform the Information Science and Engineering program as a remarkable centre of excellence in the field education to produce state-of-the-art information technologists. To produce information technologists to excel in professional career, leadership, and entrepreneurship. To inculcate multi-disciplinary research ambience among them to transform their knowledge into wisdom. Mr. Girishkumar J System Analyst,B.E. Mr. Manjunatha E Lab Instructor,Diploma. Mr. Darshan Ravindra Naik Lab Instructor,Diploma. 3ndRank in the 14 TH VTU Annual Convocation. 4 TH Rank in the 14 TH VTU Annual Convocation. 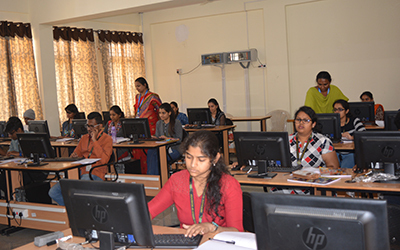 The department offers National and International Technical certificate programmes, which are valid and certified globally in the areas of computer applications. Currently both are working in Tech Mahindra as Software Engineer. Audience: IV semester students of Information Science and Engineering. Developing mini projects on multithreading concepts with Applets. Developing mini projects on multithreading concepts with Swings. 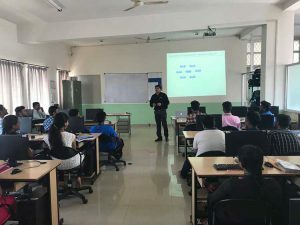 Guest Lecture on "Internet of Things"
Ganga Prasad has mainly worked in the Software and Hardware Research & Development and has over 30 years of experience. He has a Master’s Degree in Electronics & Communications from National Institute Technology, Suratkal. He has worked in the area of design and development of products in Parallel Processing, Real Time Fault Tolerant Systems and ICT for Development. He was the key designer of the first indigenously developed SCADA. 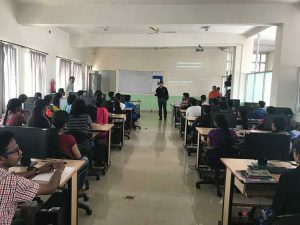 He had umpteen numbers of interactions with Industry and academia and initiated major collaborative Projects, Certification Courses in all the major areas of ITC. He has co-authored a book on GUI and published over 15 research papers, delivered around 20 Invited Talks. One Patent granted and one Filed. Three Product Trademarks awarded. He is felicitated with 8 National awards in the area of Power Systems. He was pivotal in the conduction of around 15 Major National and International Conferences, Symposiums and workshops. 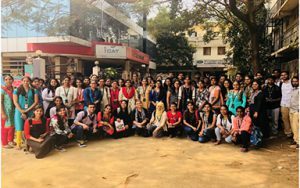 The latest conference under his leadership as the Technical Chair was, IETE’s First International Conference -2018 (IICI-2018) on “IoT, BigData Analytics & 5G” which was held at UR Rao Satellite Centre (URSC), ISRO, Bengaluru. His current interests are ICT for Learning, BigData, IIM systems and SCADA for Smart Energy Grid. He is a senior member of IEEE, ACCS, IETE (Fellow) & CSI. Past President, Secretary of ACCS. Currently he is a Scientist G and Senior Director & Centre Head of C-DAC Bangalore. Audience: VIII semester students of Information Science and Engineering. Conclusion: Students gained knowledge on the Industrial applications of Internet of Things. Current Roles at IBM: Business Operations Leader - Hybrid Cloud CTE -AP & ISA ; Regional SPOC @ IBM University Relations for South West. Audience: VII semester students of Information Science and Engineering. How to prepare for Job Industry reach !? How to face Interview !? Conclusion: Students gained knowledge on soft skills required for job hunting. Audience :VII semester students of Information Science and Engineering. 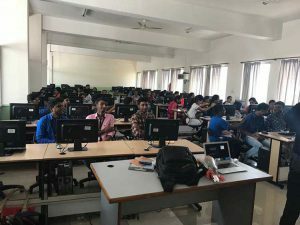 Conclusion: Students gained knowledge on the Angular 6. Small projects were demonstrated to students. 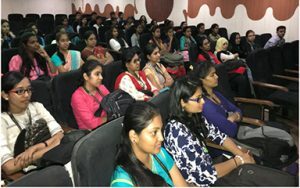 Guest Lecture In "Software Testing"
Audience : VI semester students of Information Science and Engineering. 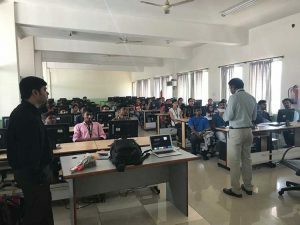 Guest lecture on “Network Simulation -2"
Event: Guest lecture on “Network Simulation -2"
Audience: V semester students of Information Science and Engineering. Creating network simulator object instances. Create Trace files, network topology. Conclusion: Students gained knowledge on the network simulator. Laboratory exercise was demonstrated after which students had hands-on experience. Prof. A.M. Padma Reddy is a renowned professor in engineering institutions with an experience of more than 25 years. He has also worked as Project Manager in Admya Technocrats Pvt.Ltd. Professor possesses a unique distinction of having worked in various capacities such as Project Manager, Consultant, Release Manager in software industry, as well as teacher, course designer, material producer and committed researcher both at under-graduate and post-graduate levels in various departments and allied areas.With the vast experience at the credit of prof. Padma Reddy the text books authored by him have been very well received by teachers and student community all over the country. Audience : V semester students of Information Science and Engineering. Conclusion: Students gained knowledge on the concepts of Automata Theory and Computability. Prof. A.M. Padma Reddy is a renowned professor in engineering institutions with an experience of more than 25 years. 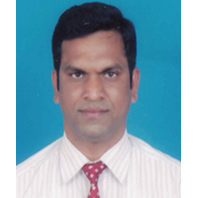 He has also worked as Project Manager in Admya Technocrats Pvt.Ltd. 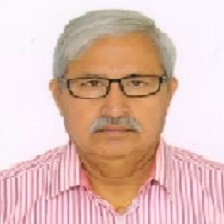 Professor possesses a unique distinction of having worked in various capacities such as Project Manager, Consultant, Release Manager in software industry, as well as teacher, course designer, material producer and committed researcher both at under-graduate and post-graduate levels in various departments and allied areas. With the vast experience at the credit of prof. Padma Reddy the text books authored by him have been very well received by teachers and student community all over the country. Audience: III semester students of Information Science and Engineering. Content of the event: Linked lists in Data structures and applications. Conclusion: Students gained knowledge on the concepts of Linked lists in Data structures and applications..
Prof. K.B. 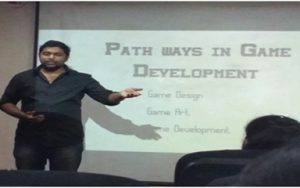 Shadaksharappa, a pioneer in his path and being an educationist for universities and corporate sector, MCQ Developer, Course Designer, Evaluator, Policy Creator, Quality Manager, he has gained immense knowledge on how training needs to be conducted for individual at various levels. He has worked in academics for 26 years and served 13 years in the IT industry. 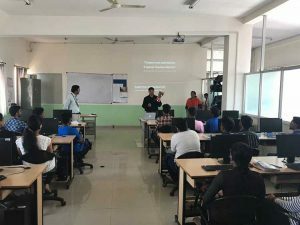 Prof. KBS has designed a unique training model for engineering college faculties and graduates, which not only teaches the participants about technical aspects rather emphasizes on grooming the personnel and molding them with go-getting attitude in the current challenging environment. He has mastered the art of corporate requirements and imparting knowledge in the most innovative and stress-free way. His trails are been considered as the best and followed in many companies. Participants: VIII semester students of Information Science and Engineering. 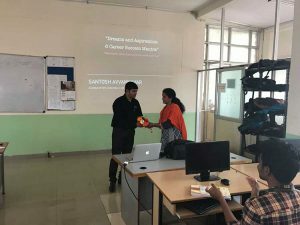 First Prize: Automated student attendance system using face recognitions under the guidance of Prof. Sathyanarayana. 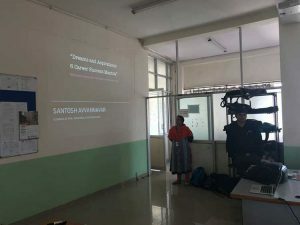 International Conference on Advances in Computer & Communication Engineering (ACCE – 2107) aims to focus and address the key issues in recent trends, advances and research results in the field of Computer and Communication Engineering through technical paper presentation and poster presentations. This Conference was open to Students (undergraduate and post graduate), Faculties, Research Scholars, Scientists and so on. 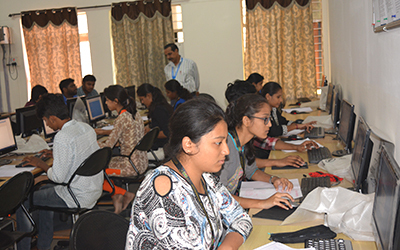 Papers submitted for presentation in the conference were reviewed by respective Journals reviewing teams. The selected papers were published in Google Scholar indexed journals with ISSN. Off IndiraNagar-Koramangala Inner RingRoad, Bangalore - 71. A Green Data Center (GDC) is a repository for the storage, management, and dissemination of data in which the mechanical, lighting, electrical and computer systems are designed for maximum energy efficiency and minimum environmental impact. The Green Data Center is an optimized data center that we can identify as "intelligent and organized ecosystem", which implements innovative applications of energy efficiency and operational by acting on three areas where the energy is consumed in the data center: energy consumed by the facility as the systems power and cooling, the energy consumed by real IT systems and an inefficient use of IT systems. Then, a formal definition of Green Data Center is: an intelligent, organized and controlled infrastructure that meets the demands of more innovative operational energy efficiency. Data centers consume 30 to 80 times the energy per square meter as compared to traditional office space. For instance, a company with a data centre of 2,000 square meters could spend up to 150 – 250 Million USD of facility operating costs over its 10 to 20 year useful life to run a data center with up to 70 percent of the costs being used for energy costs. A typical data center consumes about 250 kilowatts of power. “Solar power is ideally suited for a data centre because it is a natural source of DC power”. It eliminates the need for AC-DC conversion, which results in a 10 percentage point gain, when compared to AC power sources. “As data centers consume tens to hundreds of MW, this saving is not small”. Apart from using solar energy, other unique capabilities like water cooled lab infrastructure for POWER7 servers and a TivSAM based Private Cloud with 4000+ VMs for internal development teams has helped create this smarter data center at IBM India Software Labs, Bangalore. The project that couples solar power with water-cooled servers that run on high-voltage direct current. The method results in about a 10 percent energy savings by reducing the losses that normally happen in converting from alternating power from the grid to the direct current servers run on, according to Kota Murali, the chief scientist of nanotechnology at IBM India who developed the pilot as a side project. That level of energy reduction is significant for large data centers with many servers, but the implications of solar and servers are potentially profound for places that don't have access to reliable power. IBM's India Software Lab in Bangalore has set up a 50-kilowatt rooftop array to power about 20 percent of its data center. IBM's vision for the next-generation data center. 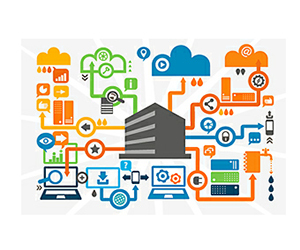 With the ever growing computing needs of human beings, data centers are more important than ever before. 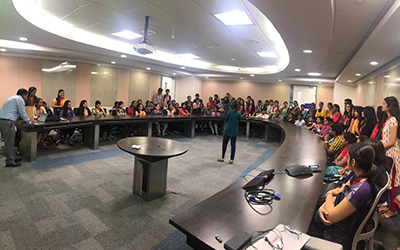 In order to cope up with the power needs of their data center in Bangalore, IBM India Software Lab has embraced the solar power. Kota Murali, one of the chief scientists at IBM India says that his facility has to face 3-6 hours of load shedding forcing them to rely on diesel generators for power supply. The fix? Well, the engineers got together to develop a 50 MW DC power supply for the data center that can provide enough energy 5 hours a day. The company has installed 6000 sqft of solar panels on the roof already. The servers mostly need DC and solar electricity saves the losses during AC-DC conversion, thus saving about 13% of electricity. IBM Operates ~45 cloud data centers across Globe !! IBM and Indian Green Grid Group (IG3) have entered into an agreement, in which IBM will design a green data centre for IG3, which is one of the largest Data Centers in the Asia Pacific Region. The data centre will be highly resilient and have the environmental protection advantages of IBM's industry-leading data centre design characterized by energy efficiency, green technologies, scalability and the latest power and cooling technologies. 12:05 am – 1:00 pm: Students had a demo on the Virtual Reality Effects. 3. Computer Graphics and Animation. 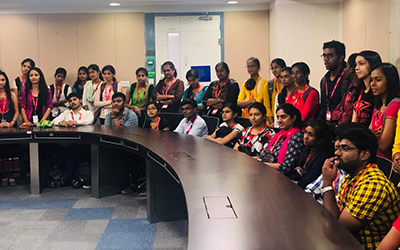 iCAT industrial visit was conducted to create awareness among students about the current technologies such as Animation, Game design and Development, UI design and Development and Visual Effects using VFX. These are the trending areas and aims at creating job opportunity for students who are having creative minds. The center paves way at creating further courses in these areas. 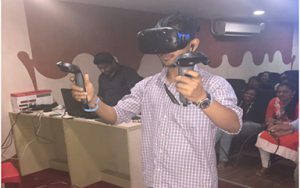 Students visualized a hands-on session on an animation tool and demo on the virtual reality with real time experience wherein they were provided with high end VR devices to experience Virtual Reality. A clear idea of the comparisons between Virtual Reality and Augmented Reality was discussed. 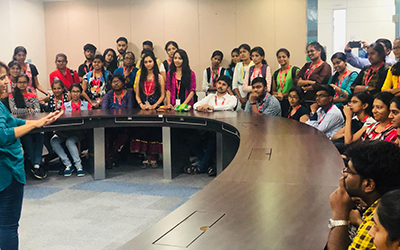 It also helped students to have a different view on their career and they also gave guidelines on how to establish their own business in these booming areas with minimum capital.